For beginners, Kayaking will prove to be the most thrilling experience of their lives. However, adventurous Kayaking maybe, it can also be a very dangerous sport. A person needs to be extremely fit, both mentally as well as physically, to participate in Kayaking activities. Moreover, the conditions as well as the water bodies where Kayaking activities take place can be highly unpredictable as well as turbulent.To enjoy this sport to the fullest, it is absolutely necessary to take certain precautions as well as safety measures. General Safety tips regarding Kayaking have been designed keeping in mind the conditions of water, Kayaking equipments, Kayaking gear, as well as the kayakers common sense. Your instinct as well as your awareness can be a big help for you incase you end up in some life-threatening situation while Kayaking. Before you embark on a Kayaking expedition, there are certain questions that should be considered before you head out. Questions such as: Am I truly built for Kayaking? What kind of climatically conditions will I come upon while Kayaking? Will I be able to handle such extreme conditions? Am I carrying the right Kayaking gear as well as safety equipment to support me in harsh conditions? Exposure to cold water to prolonged periods while Kayaking can lead to some serious damage to your body. You have to realize the following facts before you try you hand at Kayaking: Your body has a 25 % more chance to lose heat in water as compared to while in regular conditions. If you are Kayaking in cold weather conditions you have to realize that the water temperatures are always a lot cooler than the surrounding air temperature. Sea Kayakers are always at a risk of Hypothermia. Sometimes Hypothermia can also be caused by rain or your own sweat. You have to wear proper waterproof gear as well as assigned clothing while you are Kayaking. The climatic conditions are highly unpredictable and are bound to change rapidly as well as suddenly. Your clothes have to protect you from cold weather condition as well as they should be comfortable enough to allow you free movement. Try to get familiar with all your Kayaking gear as well as equipments. Learn how to use them properly and discuss their limitations with your instructor. Rudders or skegs are important Kayaking equipments where high tides, high winds as well as rapid currents are to be dealt with. Make sure you select the proper weight of this equipment so that you do not end up carrying too much load on your Kayaking trip. Dress your body keeping in mind that you might end up immersed in cold water. Also, remember that you will be spending a lot of time being wet. Always get an idea of the air temperature as well as the water temperature from your Kayaking instructor or guide before you plunge into the activity. Try to get a complete idea about the things to expect if you or your companions catch Hypothermia. You have to keep in mind that Hypothermia occurs in different stages gradually, so it has to be treated according to the symptoms it shows at that particular moment. You have to wear waterproof gear, yet it has to be comfortable and breathable. Never remove your clothing while you are in water! Always dress in layers and bring a waterproof bag filled with dry clothes and first aid kits. Always keep signaling devices such as whistles, flare guns as well as high power torches with you incase you need to signal for help. Also, try to carry an extra blanket with you at all times. You have to be self-sufficient and self-reliant at all times when you are on a Kayaking trip. Be prepared to experience sudden temperature as well as climatic changes that can occur during your Kayaking expedition. Most importantly, listen carefully as well as follow all the instructions given to you by your Kayaking trip. Most people, especially beginners, are usually better off with a rigid kayak. Inflatables do have their uses, but rigid hulls are just more versatile – especially if you plan on going out on the open ocean. An inflatable kayak would not be my first choice if a curious shark decided to take a test bite out of my kayak! One more thing to mention: there are two sitting positions for a kayak, sit-in and sit-on-top. Most fishing kayaks are sit-on-top, as they allow more storage and are easier to enter and exit; however, if you plan on fishing in cold waters, you might want to consider a sit-in kayak, since this design helps prevent your lower body from getting wet due to dripping water and waves. Most fishing kayaks come with one dry storage compartment and one tank-well (this is a compartment that holds things which can get wet, such as a bait bucket or a cast net). If you plan on doing longer, multi-day excursions, it might be a good idea to look for more dry storage. While fishing, you occasionally might want to stay where you are, rather than go with the current or wind. To do that, you will need an anchor. It is important when anchoring a kayak to always secure the anchor to the kayak at the very front or very back – if you attach the anchor line to the side, the current may cause the kayak to flip over. Unfortunately, it is very difficult, if not outright unsafe, to reach the very front or very back of a kayak from the cockpit. 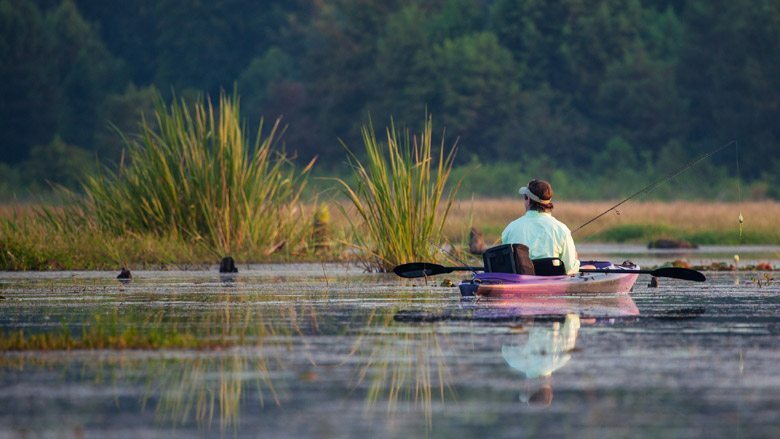 To remedy this, fishing kayaks have a pulley system on the sides, consisting of either one pulley across the entire length of the kayak, or two separate ones for the front and the back. This allows you to tie the anchor line at the side of the kayak, where you can reach, and then move the secured point to either the front or back of the hull. Kayaking is a hobby and a sport, which has seen a great surge in popularity in recent times. Kayakers love this sport as it gives them a complete access to all the undiscovered parts of a river that cannot be reached by bulky watercrafts. Kayaking also offers relaxation and solitude to people who are looking for peace. If you are not yet a kayaker what are you waiting for? Go get your kayak and move ahead to start a most wonderful and enjoyable hobby of your lifetime! Water Sports for Stress Management: 4 Ideas You Should Try!